The Troupe was nothing I expected but boy was I blown away. Everything about this novel had me in awe and I found it left a huge impression on me. Bennet created a unique and fascinating world, which was well thought out and carried so many vivid descriptions. What I loved most was that the world added to the plot to drive the progression. It wasn't just a setting/context that gave a backdrop to the characters. For some reason, the world itself felt like it's own character that gave depth to the story and had so much to tell on its own. Any novel that strips characters back and build as the plot moves on is a plus for me. We go from characters who are one dimensional on the page to having so much depth from learning and growing, and having the author reveal their backstory. I'm not going to say I loved all the characters, some of them were horrible (personality wise) and others didn't really make an impression on me. Surprisingly, I found George to be an okay character compared to the other companions that he found himself with by the end of the novel. Each of them did carry a relatable trait, which I really liked because there were some good messages to gain from their experiences. The novel was surprisingly deep and meaningful, moving beyond the story of George trying to find his father. I found it ingenious that Bennet used fantasy and mythical elements to address larger issues, which are concerns that are relevant at present and need to be tackled. It talks of family ties, desires and dreams, identity, and social and environmental issues, which is astounding to me. I got so much out of The Troupe and the final few chapters were ones that stood out to me. It was touching and even heartbreaking at times. I don't have much that I dislike about this novel (my raving above can vouch for that), but The Troupe is a long novel. This means that there are some moments where I glossed over because I found it to be slow or not entirely important to the plot. If I had to admit, I probably would say the middle parts are harder to remember than the beginning and end. Also, there is a lot of explicit words which isn't necessarily a bad thing but does restrict the audience level. 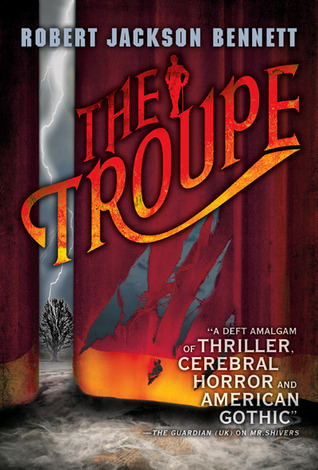 The Troupe was a work in progress for me, but once I reached the end I found that I loved it so much and was so glad I stumbled across it. It's not a hugely popular novel but it deserves to be known!